Search Engine Optimization is an important facet of every business that wants to succeed in online marketing strategies. When your business website is optimized, your customers and prospects can easily find you when they search certain keywords on search engines. No matter what industry you are in your business likely experiences seasonality. This is where your sales, traffic, or other metrics go up or down throughout the year in a predictable fashion. While some industries like hospitality and retail experience extreme seasonality, all industries and business experience shifts in sales and business operations to some extent. This is why it is important to know about seasonality, how to identify it for your market, and how to prepare to take advantage for your business today! Every business has certain times of the year or peak seasons when its products or services become familiar. These are times when a company experiences a spike in sales due to a significant number of customers seeking their products and services. For instance, when a holiday like Christmas approaches, people will start looking for Christmas gifts, or Christmas decorations for their homes. So if your business deals with these products, you will expect a spike in traffic during this time of the year. Another example is that carpet cleaners tend to see increased traffic when people do spring cleaning. They will be looking for carpet cleaners or house cleaning services. If you sell these products, you will need to adjust your SEO strategy to drive more traffic to your site and get as many customers as possible. Here is how the seasonality looks for “Air conditioning” throughout 2017 in Orlando, FL. Since Orlando is pretty hot in the summer, we would expect that there is seasonality for air conditioner repair companies, suppliers, and distributors. To see this seasonality one tool we can use is Google Trends and this data can help us examine the marketing strategy if we own an air conditioning business. During these peak seasons, you will need to do things differently like restructuring your site layout to draw focus to specific elements, or do other changes that aim at increasing traffic to your website to make more sales. What you need to know is your business peak seasons and what your target customers will be looking for. This is when you now employ seasonal SEO strategies. There are typically two main types of seasonal SEO techniques that you can use. One of them is time-based seasonal SEO. These are applied during seasons like summer, winter or monthly, annually and so on. The other type is event-based seasonal SEO strategies that are used during events and holidays like Valentine’s Day or Christmas. Seasonal SEO strategies take time to implement, depending on your industry. This makes it necessary to plan your campaign early enough. To do this, you need to know when you get peak season(s) to start laying down everything in advance. It is a good idea to give you and your team about 3-4 months to gather the resources, strategy, and production of marketing content and SEO materials prior to your high seasonality periods. All in all, you should make sure that you optimize your seasonal keywords in time so that your products and services will be visible to your customers when that time comes. You need to think about and determine what products and services you want to promote during your peak season then do a keyword research ahead of time around those targeted goods and services. After this, you should create supporting website content and landing pages that are optimized around your seasonal keywords. As you might expect this is a difficult process to go through, so ensure that you start as early as possible to avoid being caught off-guard. 1. Look at Past Years’ Data. The first step is to know when your site gets a spike in traffic to help you understand the seasonality of your business. You can know this by looking at a year to year data for the last 2 to 3 years you’re your Google Analytics account. You can also use tools like Google Trends (as seen above), SEMrush, and Ahrefs to see trends of your industry. You will need to use keywords based on user intent for customers searching for your products or services, but in general these tools are a good starting point. This past year’s data will tell you the times of the year when your site experiences a high traffic, and the keywords people search to reach to your site. 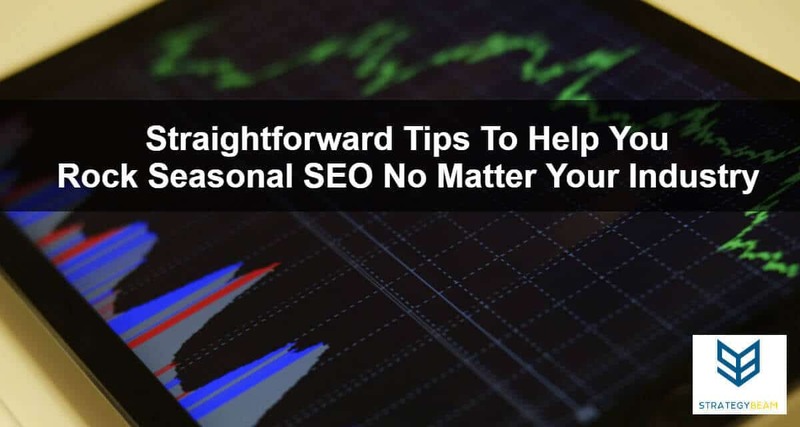 This is the starting point for your seasonal SEO campaign because it will tell you more about your audience seasonality and which products to promote. You should do keyword research to know which keywords perform well on your site. When you know these seasonal keywords and incorporate them into your site’s content, you can substantially boost your site’s organic traffic even before your peak season arrives. Keywords are the pistons that drive SEO marketing because the keywords are what trigger Google to display your content. Since your customers are searching for specific products and services using keywords, you should optimizer your content around keywords you think your customers will use. Lets use SEMrush for “Christmas trees” again and we will see related keywords that we can think about using in our content to drive qualified leads during peak season. You can also use Ahrefs to find similar, and here are some results of good keywords to think about for content about “Christmas trees“. After you’ve known which keywords drive traffic to your website, you need to start planning your site’s content. You may create some specific pages on your site that are optimized with your seasonal keywords and content, and publish these pages a few months before so that they may start ranking on search engines. If these pages are optimized for an individual annual event, you may reuse them in the following years to save you time. They will perform well because by then, they will already be indexed by search engines. Ensure that these pages have a relevant title, description and unique content, as well as headline tags. For a landing page to convert more visitors, it should have a clear offer and a powerful Call-To-Action (CTA). Aside from landing pages, creating blog posts optimized with your seasonal keywords will also help you raise awareness and boost your search engine rankings. To succeed in your seasonal SEO campaign, you need to advertise it. You can do this through your social media channels such as Instagram and Twitter, or through Email, and Pay-Per-Click management. The best way to do this is to have a content calendar containing every content you want to post on your advertisement sites or blogs. It will help achieve your goals without missing out on anything. When doing this, remember your competitors are also doing the same, so you’ve to play your game differently. If you’re promoting your seasonal SEO campaign on Facebook or emails, consider including some killer information containing some tips and advice around your topic and then hint about the approaching event. Regardless of your business or industry, applying seasonal SEO strategies correctly will go a long way in boosting your business sales. Just ensure that you plan everything well in advance to make it easy for you when your peak season arrives. If you are ready to reach your business goals and increase profits then you need to be prepared for seasonality. Too many companies lose market traction or simply don’t optimize their online marketing strategy to take seasonality into consideration, and this means losing out on lots of money. If you and your team are ready to take the next step then consider talking with me about your needs and we can work together to improve your online presence and drive more sales. Use the form below if you want to get started working with our professional digial marketing experts today!